It’s exciting to see how far an idea can go. Yesterday, at a press conference in downtown Akron, an idea was unveiled – an idea that has the potential to help children, advance medical science, and create jobs. 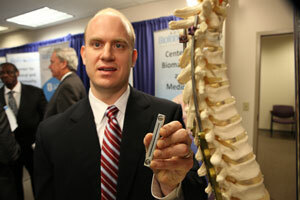 The Austen BioInnovation Institute in Akron (ABIA) announced the formation of APTO Orthopaedics, the first medical device company created out of the institute. Stephen Fening, PhD, director of orthopedic devices for ABIA, and Todd Ritzman, MD, a pediatric orthopedic surgeon at Akron Children’s Hospital, created the company to test whether a magnetic device may be a better way to treat young children with scoliosis, or curvature of the spine. Treating scoliosis in teens is fairly straightforward with spinal fusion surgery. But children with early onset scoliosis are much more challenging because they are still growing. Spinal fusion surgery prevents the growth of the spine and thorax during a critical period of lung development and impacts quality of life into adulthood. For young children with significant spinal deformities, the gold standard of care is to implant dual growing rods to straighten the spine, but doctors must operate every six months – over several years – to lengthen the rods. Drs. Fening and Ritzman have obtained two provisional patents on a device that once implanted could be adjusted outside the body, eliminating the need for repetitive surgeries. 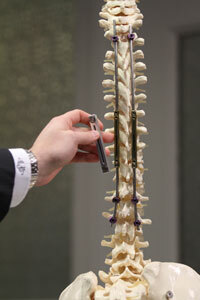 The idea is to use a magnet to loosen, lengthen and reset the screws in the growth rods. Ideally, this procedure could be performed in an exam room, not the OR. From here, the concept will move through bench testing, animal studies and the FDA process. Most or all of the ABIA partners – the University of Akron, Akron General Medical Center, Summa Health System, the Northeast Ohio Medical University and Akron Children’s – will be involved. ABIA leaders are optimistic that the concept is a platform technology that would have medical applications far beyond early onset scoliosis. But even if it didn’t, Dr. Ritzman believes the idea has the potential to save millions of dollars in healthcare costs – not to mention the intangible benefits of keeping children out of the OR.